Royston Diesel Power said its enginei EFMS (electronic fuel management system) has been specified as part of the newbuild program for the first dredging vessel commissioned in 20 years by CEMEX UK Marine. The new £30 million vessel has been designed to extract sand and gravel from depths of up to 55m, including in the challenging conditions experienced in the North Sea. Under construction at Damen Shipyards Galati, in Romania, the 100m long, 7,000 metric ton vessel, CEMEX Go Innovation, will replace CEMEX’s Sand Heron, offering the capacity to deliver up to 20 percent extra load per trip. enginei will be installed as part of a comprehensive suite of advanced digital marine technologies on board that are designed to offer enhanced long-term operational safety and efficiency performance. Greater integration of advanced real-time information tools will be expected to contribute to reducing fuel and maintenance costs. enginei will see the new dredger’s crew and operator furnished with detailed real-time engine performance and other mission critical information. It uses Coriolis flowmeters and sensors to accurately monitor the fuel being consumed by each of a vessel’s engines, which is tracked against GPS data, voyage details and operational mode. The data is collected, processed and relayed to bridge and engine room-mounted touchscreen monitors to enable the ship’s master to adjust vessel speed and take whatever other actions are needed to reduce fuel consumption. enginei installation work will be carried out by Damen ahead of system commissioning by Royston and CEMEX Go Innovation entering service in late 2019. Damian McCann, Royston’s product manager, said the optimization of fuel use and the minimization of emissions are critical issues for vessel operators such as CEMEX Marine. 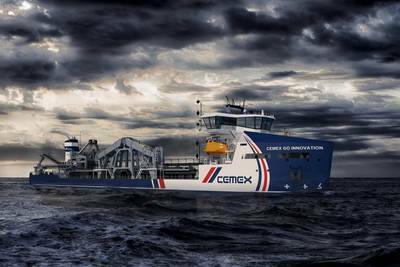 “We are seeing increasing interest in our technology from the marine sector, where vessel operators like CEMEX UK want to achieve measurable operational and cost savings for their new vessels,” he said.